Production workers often lift up to 10 metric tons of material a day. According to the Work Foundation Alliance (Lancaster, UK), 44 million workers in the EU suffer from work-related musculoskeletal disorders. Now researchers in the EU's Robo-Mate project have developed an exoskeleton that makes loads up to ten times lighter to lift or carry. The project partners presented the first prototype at Fraunhofer IAO in Stuttgart on 12 June. Effortlessly, a factory worker lifts a seat out of an old car. In a few nimble manoeuvres, he grips the 15 kg seat, hoists it out of its anchoring, and carries it to a station to join the other seats there. These fleet movements are made possible by an exoskeleton, a kind of external supporting frame that actively assists workers. Is this reality or science fiction? Production and assembly work includes many physically demanding activities that still have to be carried out by humans. This applies to small-scale series and prototypes, where the assembly of each piece is so individual that no robots could be programmed for the task. But it is also true for all kinds of activities that are either too complex for robots, cannot be standardized, or simply require human flexibility. One example is the disassembly of motor vehicles: as every used car brought in for dismantling is different, the removal of each vehicle part – such as seats or batteries – is individual. These tasks put a great strain on workers, particularly when they are performed for eight hours at a stretch. Workers engaged in production and disassembly tasks often lift and carry several tonnes of material in a day. Damage to the spine and long-term health problems are an almost inevitable consequence. In addition to the worker's personal suffering, this also creates high costs for the healthcare system. Meanwhile, employers face the disadvantages of lost productivity through sickness, early retirement and difficulty recruiting new staff. The EU has set itself the goal of keeping manufacturing bases and jobs in Europe. But it will be necessary to make production conditions people-friendly in order to reduce the number of sick days and ensure that skilled workers remain fit and able to work over the long term. As well as protecting workers' backs and supporting their posture, the Robo-Mate exoskeleton also helps them to lift heavy objects. By means of motors and sensors, it reduces the effective load people have to bear to a fraction of the actual load while also preventing postural damage. Although most people will have seen exoskeletons only in science fiction and superhero movies, there are actually two established fields of application for the technology: in the military and in medical rehabilitation. To date, however, no exoskeleton has been developed for use in manufacturing. This was precisely the goal that the partners in the EU's Robo-Mate project set themselves. Since the end of 2013, twelve research institutes and companies in seven European countries have been working together to develop a helper for production workers. Now the first Robo-Mate prototype is ready; it was presented at Fraunhofer IAO in Stuttgart on 12 June. "Our exoskeleton prototype consists of modules for the arms, the trunk of the body and the legs," explains Prof. Dr. Wernher van de Venn, coordinator of the Robo-Mate project and Head of the Institute of Mechatronic Systems at Zurich University of Applied Sciences in Switzerland. Arm modules: The modules for the arms are attached to the upper and lower arms. They actively support workers when lifting heavy loads: using motors, they deliver an up to tenfold reduction in the force acting on workers when lifting an object. "A car seat weighing 15 kilograms feels like 1.5 kilograms when workers lift it with the help of the exoskeleton," says Prof. Dr. Carmen Constantinescu who heads the project at Fraunhofer IAO. Trunk module: The trunk module is designed principally to stabilise and protect the back and spinal column. It helps workers to keep their torso straight when carrying out lifting and bending tasks, protecting the spine from twisting and slipped discs. Leg modules: The exoskeleton supports the legs using two modules that stabilise the inner thighs from the trunk module. When workers carry out tasks in a squatting position, which can put the thighs under great strain, the leg modules stiffen and form a kind of seat, so that workers do not have to exert any additional strength. 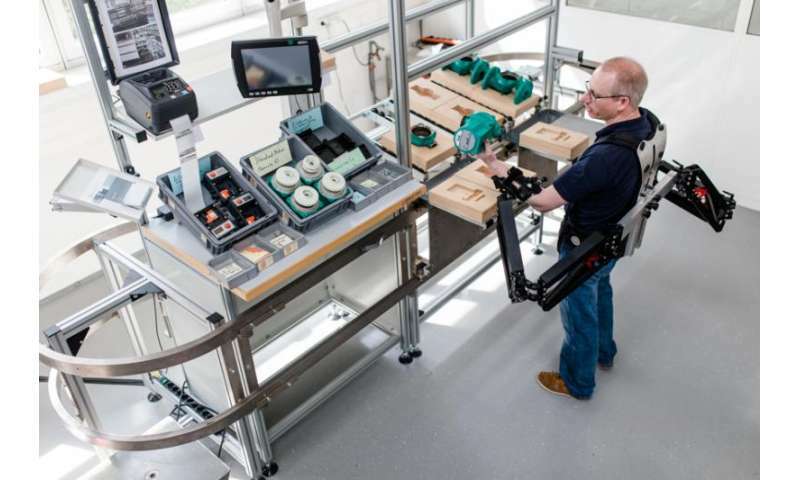 To find out where most assembly and disassembly problems lie and what the exoskeleton needs to be able to do, scientists at Fraunhofer IAO used software to simulate the work steps of various application partners in the project. They carefully considered the sequence of movements as well as which forces act on the body and how. This identified key steps where the strain on the body is very strong. Next, Constantinescu and her team of researchers simulated the corresponding work steps with the exoskeleton – which meant they could pinpoint the steps for which the exoskeleton was a useful tool and rule out those for which it was unsuitable. "Before now, nobody has managed to calculate the person and the surrounding exoskeleton as a single unit," says Constantinescu, describing the particular challenge of this undertaking. But that was precisely what had to be done in order to develop the skeleton and evaluate the use cases. Plenty of research is still needed before the Robo-Mate exoskeleton can become an everyday presence in European factories. One task is to make the exoskeleton and its use safe for its users and their environment. To ensure this, safety experts from the participating companies and institutes are working on a series of requirements. Another issue is the matter of acceptance: "The only way this kind of support can be successful is if workers themselves accept the technology," says Prof. Dr. Michiel de Looze, partner for human-robot interaction at TNO, the Netherlands Organisation for Applied Scientific Research TNO. Identifying ways of bringing production workers on side when introducing the technology was part of the project's remit. Design was another part: "The prototype is functional, but its appearance is still off-putting – you can see all the technology and the wires. It's probably a bit scary for people," says Prof. Wernher van der Venn, coordinator of the Robo-Mate project and professor at Zurich University of Applied Sciences. For this reason, designers are developing a casing that is functional yet also gives workers the impression it is there to help them: "We're not looking to make superheroes. We want to develop a helper that supports production workers in their everyday work and keeps them healthy," says Dr. Leonard O`Sullivan, specialist in ergonomics and product design at the University of Limerick in Ireland.